SAN FRANCISCO, CA--(Marketwired - Nov 7, 2013) - SupersonicAds Media Group (www.supersonicads.com), the leading marketplace for mobile and web based native in-app advertising, has partnered with multiple major motion picture studios, including Sony Pictures, Universal Pictures, Lionsgate, Disney, Paramount, Warner Bros. and Fox, to promote theatrical, DVD and TV show releases. With the growth of Media and Entertainment apps worldwide, motion picture studios are tapping into a lucrative target market, via native in-app brand engagement advertising platform. 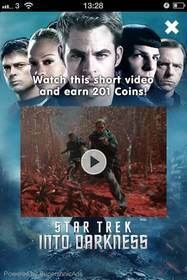 Campaigns across the US and Europe from major studios include Paramount's Star Trek: Into Darkness, Sony Pictures Home Entertainment's Smurfs 2 and Universal Pictures Home Entertainment's Despicable Me 2. DVD or Blu-ray releases are promoted with a trailer followed by a call to action such as purchase or download on Amazon or other online site. SupersonicAds' video ad platform on mobile and web tracks user behavior and consumption data and turns it into actionable data for ad targeting. Several third party data sources are integrated into the platform for the detection of user intent data, driving CTRs upwards to 15% on average. The high video completion rates and high CTRs associated with CPV 'opt-in' model lend themselves especially well to film and DVD releases. Audiences are both relaxed and engaged when using entertainment apps they know and trust resulting in frictionless purchases through mobile devices. James Salins, Managing Director at SupersonicAds, noted, "We are seeing an advertising synergy between mobile entertainment app users and home entertainment video releases, resulting in successful conversion rates on our in-app advertising campaigns." SupersonicAds has a network of leading entertainment apps, which includes: gaming, networking, texting, music and film. Entertainment apps, whether they are on Facebook, mobile or tablet account for an increasing amount of time spent on devices; typically 66% on mobile and 80%+ on tablet. SupersonicAds (www.supersonicads.com) is a market leading cross-platform provider of native in-app brand and direct response advertising solutions since 2009. SupersonicAds powers a network of over 1000 leading app/game publishers reaching a global audience of more than 400 million users across 200 countries. The company is based in San Francisco with offices in London, Tel Aviv, New York and Los Angeles. Star Trek brand engagement in-app advertisement.